Following Joseph’s selection to represent the GB Junior Team at Munich over the weekend, he managed two very impressive gold medal performances in the quad on Saturday and the double on Sunday. Joseph teamed up in a quad with boys from Tideway Scullers, Maidenhead and Windsor Boys School to claim top spot on the podium in a tough headwind that tested the crew who had been together in the boat for the first time. The following day, Joseph paired with Lawrence Joss of Tideway Scullers to post the fastest time in the double and claim gold. Both of these races rounded off what I am sure will be the first of many international regattas that Joseph takes part in. Congratulations to Caitlin Warren who has been selected on the England Pathways scheme, for someone who is so young this is a great achievement. This accolade earmarks her as one of a group of potential future Olympians and to have one at CLS is fantastic. This week is the last week that we will be at the Hermitage until the 15th June and club sessions will continue as normal at CLS. As we continue to raise funds in earnest for the new club singles, we would appreciate it if everyone who attends this session to still pay the £2 to Bob on arrival at the club and the money will go directly to the boat fund. 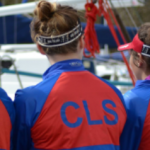 This weekend we also saw a great number of our ex/current athletes (but to us, they’ll always be the latter) racing and winning medals at BUCS Regatta (the Universities National Rowing Championships). Rose Cowperthwaite won a bronze medal coxing the men’s novice four, Dan Middleton won a bronze in the men’s pair, Lauren Irwin won gold in the women’s pair, James Snowball with a bronze in the championship 8’s and Chrissy Castledine won Silver in the women’s lightweight 4x. If you have anyone who you think may be generous enough to donate to our crowd funding effort to purchase a new single, there are only 4 weeks left, please see the link below.